Have you ever wondered why some people are vegan or vegetarian? If you are a vegan or vegetarian there is now research to show how our brains work in a different way to people who eat meat, and we are more empathetic to suffering in both humans (conspecifics) and animals than omnivores. One interesting group I want to research are a subgroup of Straight edge called Hardline who are punk fundamentalists and into radical deep ecology which includes veganism. In the following few weblogs I will be covering my findings with interviews and insights from the Hardline punk scene. For now though I found a piece of research that looks at feeding habits and levels of empathy associated with the different groups (vegan, vegetarian and omnivores). The Brain Functional Networks Associated to Human and Animal Suffering Differ among Omnivores, Vegetarians and Vegans is a neurology experiment using functional magnetic resonance imaging (fMRI). The study postulated that neural responses to negative images of suffering involving both humans and animals differed amongst omnivores, vegetarians and vegans. The study was the first to measure neural correlations of empathy towards non-conspecifics in people with different social norms and their feeding habits (Filippi M, Riccitelli G, Falini A, Di Salle F, Vuilleumier P, et al. 2010). The term veganism was an extension of vegetarianism and sees all life as sentient, rejecting any animal suffering (including dairy, honey, and so on ), whereas vegetarians still eat dairy. Ethically speaking, vegans believe it is wrong to use and kill animals. This philosophy is based on ‘values and attitudes toward life, nature, and society’, which is more than just a food choice (Filippi M, Riccitelli G, Falini A, Di Salle F, Vuilleumier P, et al, 2010: 2). The study comprised of 60 right-handed healthy subjects with different feeding habits, 20 omnivores, 19 vegetarians, and 21 vegans. The paper did not explain how they arrived at those numbers. The experimental design, using fMRI attached to the subject’s head, presented them with 150 pictures (40 human suffering, 40 animal suffering and 70 pleasant landscapes) in random order, using presentation software specifically designed for neurology (www.neuro-bs.com version 9.70). The experiment was designed to see if visual representations of abuse and suffering affected people with different feeding choices and to monitor the different components of the brain’s networks associated with empathy and social cognition. They tested why the neural processes, showing empathy in vegetarians and vegans, extended to animals more than the omnivore subjects. It also comprised of a questionnaire based on an empathy assessment, showing an Empathy Quotient (EQ) score. The main finding was a commonality of the functional architecture of emotional processing in vegetarians and vegans. It found that the vegetarians and vegans had a higher activation of empathy, related to areas of the brain, than omnivores, during both negative human and animal scenes, regardless of species. The part of the brain network that causes this is thought to be associated with emotions and social behaviour (D’Argembeau, A., Stawarczyk, D., Majerus, S., Collette, F., Van der Linden, M., et al, (2009). 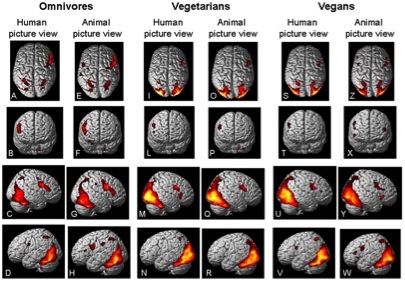 Filippi M, Riccitelli G, Falini A, Di Salle F, Vuilleumier P, et al conclude that brain responses are evoked via negative images of suffering and significantly differ between vegetarians, vegans and omnivores as a comparison group. Also, there was a significant difference between the vegetarians and vegans. They suggest, therefore, different motivational factors are responsible for this, due to individual preferences and moral attitudes. (Filippi M, Riccitelli G, Falini A, Di Salle F, Vuilleumier P, et al 2010). Table 1 sums up the findings and Figure 1 shows each feeding groups outcomes from the fMRI. 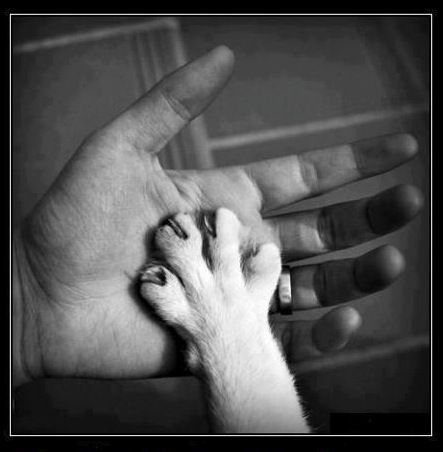 Responded more to human suffering than animal suffering. Displayed more emotional empathy to human suffering than both the omnivores and vegans but slightly less than the vegans to animal suffering but more than the omnivores. Responded the most to animal suffering than the vegetarians and omnivores and only slightly less than the vegetarians to human suffering, however it was more than the omnivores. Table 1 – Feeding habits and empathy response to human and animal suffering images. Figure 1 – ‘Within-group analysis of activations. Cortical activations on a rendered brain from omnivore (A–H), vegetarian (I–R) and vegan (S–W) subjects during observation of pictures showing negative valence scenes of humans (A–D, I–N, S–V) or animals (E–H, O–R, Z–W). Images are in neurological convention. doi:10.1371/journal.pone.0010847.g002’ (Filippi M, Riccitelli G, Falini A, Di Salle F, Vuilleumier P, et al (2010). The researchers did recognise the study had limitations with regards to the baseline scenes of landscapes, as it does not adequately measure a neural response to suffering per se; and they felt that further studies were needed to confirm their results (Filippi M, Riccitelli G, Falini A, Di Salle F, Vuilleumier P, et al, 2010: 7). This I agree with, and I would be interested in choosing subjects from Punk, Hardline and non-punk/hardline as subjects to measure fMRI responses, for the same type of study. For now though it does prove that vegans and vegetarians feel more empathy but the real research that I would personally like to study is does the brain dictate our feeding habits or do we ‘train’ our brains to react to suffering?